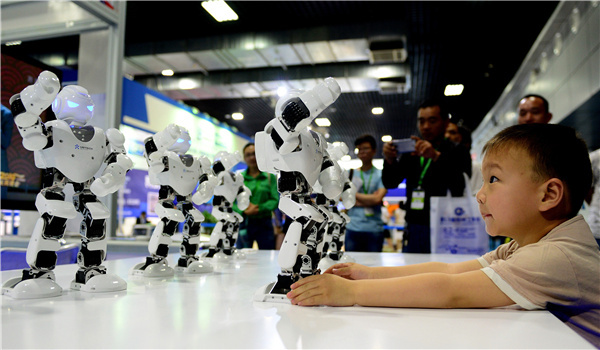 China will accelerate the development of the internet working with advanced manufacturing to boost innovation and entrepreneurship and the integration of enterprises of various sizes to advance the upgrading of the economy. The integration of the internet and the real economy will be further expanded, and the development of the industrial internet accelerated through the Made in China 2025 strategy to transform the nation into a global industrial internet leader, according to the decision made at the meeting. The industrial internet refers to a computerized interconnection of machinery, big data and the internet of things that analyzes data from machinery and adjusts its operation. "Pushing the internet plus advanced manufacturing forward is an important measure to enable the transformation and upgrading of the real economy. China owes the fast development of its new growth engines to its abundant human resources and talents, vast market and the prudent yet accommodating government oversight" Li said. The meeting decided that the construction and upgrading of internet infrastructure in industrial enterprises will be vigorously pursued to enable greater interconnectivity within enterprises and between production equipment and information systems in different areas, both upstream and downstream. The integration and sharing of manufacturing resources and data will be promoted, while a coordinated manufacturing system linking all industries and businesses will be developed. The development and promotion of industrial cloud platforms will be boosted. Leading enterprises will be encouraged to develop cloud platforms. Small and medium-sized enterprises, or SMEs, will receive support in uploading their business systems to cloud platforms. A public platform that supports mass entrepreneurship and innovation will be established. Technical support will be increased to develop a standard system of the industrial internet. The R&D and promotion of intelligent, connected equipment will be promoted in such key areas as industrial robots and large power equipment. Emerging technologies such as artificial intelligence will be more extensively applied. "We should create a vibrant and enabling environment for the internet working with advanced manufacturing by further streamlining administration, enhancing compliance oversight and improving government services. This will enable the industrial internet to develop in a more open and integrated manner and put China at the forefront of the new round of the industrial revolution," Li said. It was also decided at Monday's meeting to step up policy support for the industrial sector. The government will allocate special funds to support the industrial internet push. Companies will be encouraged to scale up financial input through bonds and stock rights. They will also be encouraged to build up cybersecurity, and the management, and technical systems for network and platform security will be built in key manufacturing sectors, including automobiles, electronics, energy, aviation and aerospace. "We should give full play to the role of the market and businesses and provide policy support as necessary. The government will help capable enterprises to establish major industrial internet platforms for the development of the industrial intranet and internet. The government must step up the development of infrastructure to make internet services faster and cheaper for SMEs," Li said. China will provide more quality and green agricultural products through technological advances, Han Jun, director of the central agricultural work leading team office, said Sunday at a forum held by the Chinese Academy of Sciences (CAS).